The 4th ANNUAL ASIAN WORLD FILM FESTIVAL (AWFF) announced Festival award winners during the closing night ceremony at the ArcLight in Culver City. Almost 40 feature films from 25 participating countries were presented during the nine-day festival that included 17 Oscar® Foreign Language submissions and a dozen Golden Globe® submitted films. The Awards ceremony, presented to a sold-out audience, was followed by a screening of China’s In Harm’s Way and a reception at the Culver Hotel. “The snow leopard is one of Asia’s most iconic animals and an ambassador of the continent’s rich and diverse cultures,” says founder and chairman of the Asian World Film Festival and Kyrgyz filmmaker Sadyk Sher-Niyaz. “It’s a natural fit for our award and our festival!” The Asian World Film Festival’s main cinematic award is named after the snow leopard. Snow Leopard Trust. Lisa Lu was honored with the Snow Leopard”Lifetime Achievement Award”. She has been making movies for over six decades, including The Joy Luck Club, The Last Emperor and this year’s smash hit Crazy Rich Asians. Lu is considered one of the few first Chinese American actresses that opened the door to Hollywood. The award was presented by actress Ming-Na Wen (Mulan, Joy Luck Club) who has worked with Ms. Lu on numerous films for almost three decades. The “Snow Leopard Rising Star” Award was presented to Awkwafina whose outlandish character was the scene stealer in Crazy Rich Asians. 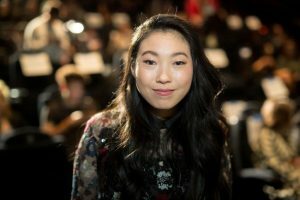 Also known for her rapping talents, Awkwafina achieved acclaim for her acting in Ocean’s Eightand Neighbors 2: Sorority Rising. The award was presented by Justin Chon, AWFF Jury Member and previous Rising Star Award recipient.